Dana-Farber oncology nurses have grown accustomed to being asked how they can do such a difficult job every day. But talk with them and you’ll learn that they feel far more blessed than burdened by these challenges. In honor of National Nurses Week May 6-12, we asked four Dana-Farber nurses to reflect on what drew them to the field of oncology, and what they enjoy most about it. Appleby and her colleagues say they were inspired to enter nursing because they saw it as a noble profession. When, as practicing nurses, they met and worked with cancer patients and their caregivers, they felt compelled to make it their area of focus. 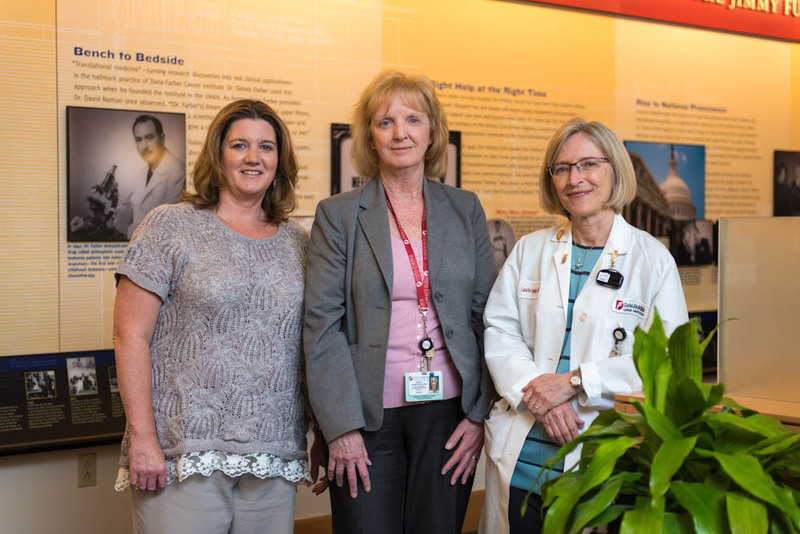 Whatever their role at Dana-Farber, nurses and nurse practitioners here believe that helping individuals and their loved ones face cancer treatment makes for very satisfying work. Anastas, who previously worked in an emergency department, no longer has direct patient contact. Still, she knows she is improving care by helping design systems that clinical colleagues use in treating patients. “The safer these systems, the safer and more efficiently the patients can be cared for,” she says. This sense of being part of a bigger whole is a strong motivator for Dana-Farber nurses, no matter what their job responsibilities. Having a common goal is another draw. And the stronger the bond, nurses agree, the more comfortable the patient will feel. Trisha undoubtedly helped save my husband’s life! Nurses are heroes! Happy Nurses Week! Trisha is one of the best ever! Took such great care of me 20 years ago and we’re still in touch today. Thanks for everything you do Trish!!! !